Regular dental care helps to prevent the need for inconvenient dental emergencies. However, dental emergencies do unfortunately occur. At GHB Dental Care, we specifically keep select vacant appointment slots available for such occurrences daily, allowing us to see our registered patients on the same day (within normal working hours). We often have availability for non-registered patients also. If you are non-registered patient, give us a call and we will endeavour to get your issues resolved as quickly as possible. 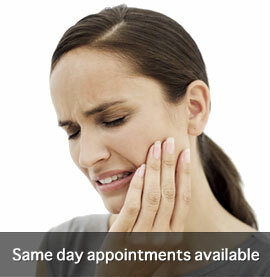 We charge a flat fee of £80.00 and we deliver the treatment required to sort your toothache within this fee. Whether it be a tooth that needs a new filling, a tooth that needs to be removed or a root canal treatment that needs to be commenced, the £80.00 covers the emergency appointment AND treatment carried out at that appointment. Please note that a £10 non-refundable deposit is taken at the time of booking the appointment. Our registered patients are automatically enrolled in a dental membership scheme. This can assist you with the cost of emergency dental treatment if unable to attend your regular dental practice if on holiday. In the unfortunate event that a claim is made, this does not affect registration costs thereafter in any way.